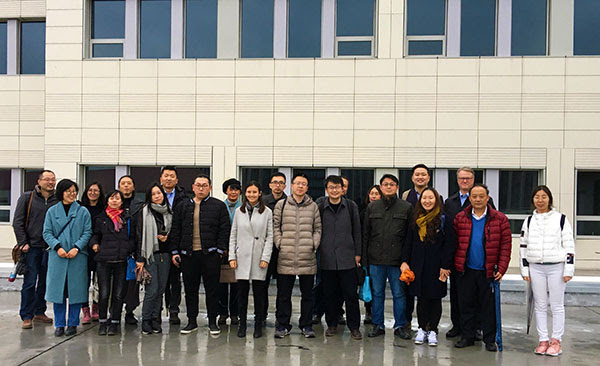 March concluded a great first quarter of 2018 for our chapter - read this month's newsletter to learn about our agreement with the Architectural Society of Shanghai China, meet our Membership Director, and see some of our recent and upcoming events. On March 29, 2018 our chapter undertook an important step in developing our ties to Shanghai’s architecture community when we signed a memorandum of understanding with the Architecture Society of Shanghai China (ASSC), the city’s professional organization for architects. AIA Shanghai President Alton Chow, AIA and ASSC Chairman Cao Jianming signed the letter during a meeting between the leadership of our two organizations. This agreement will lead towards future collaboration to provide educational exchange and communications further promote excellence in the practice of architecture in Shanghai. I have been involved with AIA Shanghai since February of 2016, serving as Education Director and as of January 2017 both Education and Membership Director. I have been honored to be a part of the recent, fast-paced development and growth of the AIA Shanghai chapter. My responsibilities for my role as Education Director include working closely with presenters in obtaining adequate information for composing Learning Unit applications which must be submitted to AIA National for review and approval. Additionally, I am responsible for reporting AIA member attendance after these events. My responsibilities as Membership Director include both internal and external facets. Internally, I report membership statistics to our executive committee on a monthly basis and discuss ways to manage and grow the membership. Externally, I help people with membership applications and help to resolve problems people may encounter when joining or renewing. I am connected to a great team at AIA national which is instrumental in solving larger membership issues. Please reach out to me membership@aiarchitectsh.org if you have any questions regarding membership or learning units. I am very happy to help out! Over 50 people turnout on March 3 for the first design lecture of the year with Nuno Fontarra from Mecanoo Architects. With PEOPLE, PLACE, AND POETRY as the main theme, three recent projects: Palace of Justice, Weiwuying Center for the Performing Arts, and Three Culture Centres and One Book Mall were presented in details. The Q+A session after the talk also generated an overwhelming response from the audience, as the crowd enjoyed a great Saturdayafternoon of design exchange. 25 people joined us to tour the Artemed hospital designed by US architect Gresham Smith and Partners. This hospital is the first wholly foreign owned hospital in China and is located in Shanghai Free Trade Zone. The grande opening is scheduled for October 2018. We had a great first members’ quarterly meeting of 2018 at the Jingan St. Regis Hotel. The chapter officers described the organization of our leadership and invited members to become involved and further develop our community. Over 60 people attended and we look forward to further connecting with our membership in upcoming meetings. AIA Shanghai is launching its first ever annual awards program to identify and celebrate China's best Architecture and design. An international jury comprised of leading figures from the field will select the best projects of our time. Look for more information including deadlines and submission instructions to be announced next month! Young Architects is a new platform for emerging talent to learn about and discuss evolving trends and challenges in China. There will also be opportunities to learn about the ARE (Architecture Registration Exam) and pathways to success as well as upcoming events for the 2019 year. For the opening event, AIA Shanghai invites four talented professionals to speak about their respective journeys in the architecture profession, challenges and achievements along the way. This year’s AIA National Conference on Architecture will be held in Las Vegas. With this year’s theme of “A Blueprint for a Better Future”, Las Vegas is an ideal setting for architects to come together to discuss the challenges facing the profession. GreenBuild China 2019 | Submit a Proposal Now! Greenbuild China offers a forum for the green building community to unite, change lives, revolutionize business and address pressing issues, such as air quality, human health, energy use and global climate change.